Today is a FUN day at TallMom. I LOVE LOVE it when I can give back to all my Bloggy friends. To celebrate my First Marathon, and in hopes of finding the solution to "I want to wear my race medal around everywhere...but..." I give you the Medal to Wear all Day Giveaway..
For my 30th birthday my friends Lynette and Tom purchased an AMAZING necklace to commemorate my finishing my first Marathon. Lynette loves to shop on Etsy.com. For those of you who have never shopped on Etsy, their mission is to enable people to make a living making things, and to reconnect makers with buyers. To build a new economy and present a better choice: Buy, Sell, and Live Handmade. This is a site where you can purchase handmade items directly from the Artists. PRETTY SWEET!! Anything from baby dolls, paintings to jewelry this is a GREAT place to shop for unique gifts. I specialize in hand-stamped jewelry and one-of-a-kind artisan designs. I only use sterling silver, 14 kg and genuine gemstones. The hand-stamped jewelry designs are handcrafted by me. Please note that the differences in the finish and 'imperfections' such as floating letters not perfectly "typed" and the like, are part of the inherent character and charm of the piece and should not be considered defects. Now your thinking "How do I win?" Well it is simple. 1. Go visit My3Gemz shop (CLICK HERE) and click on her 3 pages of AMAZING handmade items. Leave a comment here about which piece(s) you love and/or ideas of things you would like to see Darlene create in the future. Don't forget to thank Darlene for her generosity, she will be reading this post and comments. (1 entry). Tally it up that is 5 chances to win.... GOOD LUCK!! You know you want to have a Medal you can wear all day with PRIDE!!! Giveaway Entries will end at 7:00am(PST) on Monday 7/6/09...With the winner announced that morning. FYI check back because even if you don't win you will still get something REALLY COOL!!! I am so excited for this giveaway. 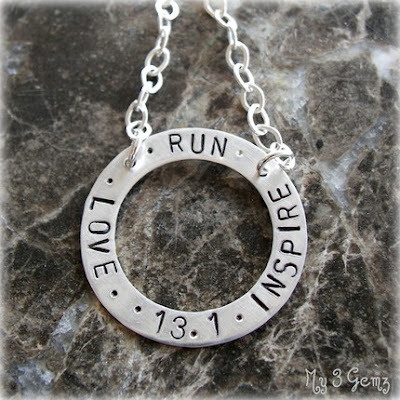 I would love the Half Marathon Runner Handstamped Necklace, with 26.2 on it. Thanks for the link to this seller, I may get my girls something for Christmas from here! I just added a blogroll and you are on it. So very cool!!! Her stuff is great! I love the runner necklace but all of her jewelry is sweet -- the dandelion wish is especially so. Yay! Great giveaway! Have a good weekend. *Make sure you are getting all the entries you can :) Thanks for playing!! second I like the 13.1 mile circle necklace better than the 26.2, but I want a necklace for 26.2! I love the Marathon Runner necklace. There are a lot of great things on this site. I am bookmarking it for future gifts!! PS - I follow your blog! I love the marathon runner necklace but also i am torn because I like tiny initial necklace. now that i am working I have been trying to find more jewelry that is simple that I can wear to work! Also I am already a follower! I love the necklace you have; I too, would want the 26.2, my mom wanted to get me a necklace at the expo but I didn't like any that they had. This one is so much more my style. wow, how nice of her to give such a beautiful piece of jewelry away. i love them all. i think the diamond shaped one is neat and different. thanks for the link! very cool! I especially like the charm necklace things which would be even MORE cool as key chains. ps. i'm already a follower of your blog. Thx for the contest. and have a great weekend! I love the marathon handstamped necklace...I have been looking for something fun to celebrate running a full marathon earlier this year...that would be awesome! Hi, I think that this give away is awesome.. thanks for doing it!! I like the marathon hand-stamped necklace idea, but I would put 5k on it because I haven't done a marathon yet! I absolutely LOVE the love earrings and the hug and kisses earring! Thanks again for doing this give away! I'm excited that you're doing this Mel! Darlene has such fabulous stuff in her shop, as do so many of the artists on ETSY! I am so glad that you love your necklace, too:) We wanted you to have something special. It's great that you're passing it on! I love the marathon runner handstamped necklace - with the crystal. Very sweet. I soo love the My Love, My Life, My Family Handstamped Necklace it is so sweet and true. I love the name bracelet where I can put the names of the my family. It is very beautiful. Darlene all your jewelry is beautiful. I am a follower and I linked it from my blog. you are now on my blogroll and will link back on my next post! also, thanks so much darlene! I also love the 26.2 circle necklace. I've just run my 4th marathon, but it might be my last. :) That necklace is just so appropriate. Love it! I might have to do some shopping through Darlene... All of her items are great and look to be very wearable. I love, love, LOVE the marathon runner necklace with the 26.2, run, and the crystal. I would wear that every day! Great giveaway! And great blog. I am surprised I haven't stumbled upon it before now. Love your competition Mel - it's even better than the pink socks! I'm not going to enter this time, because I definitely want to get one of those lovely necklaces when I complete my first half!! So I need to save it till then! LOVED chatting last night. So so great. It feels like we're real, proper buddies now :)! i would love Waterfall Necklace!! pretty!! I like the waterfall necklace. Thanks for the contest! Congrats on your marathon! This is an awesome giveaway. Count me in for 5 please. 1. I love the marathon runner necklace. Since I just joined Team in Training I would love to see one that said " I run to save lives." or a custom one that said I run for ....... Darlene is so talented and creative, all her pieces are beautiful. 2. Just became a follower. 3. Heading over to my blog to add something to my sidebar and the giveaway. Thanks again to you and Darlene! OK...even if I don't win the necklace, I'm likely to buy one from to replace the Nike 1/2 Marathon Tiffany necklace that I tragically lost...somewhere... (GAH!). Lisa sent me over here. Love your blog, am following. Thanks for a great giveaway! I'll link to your post today. Exactly why I'm not allowed to look at etsy - I love it all!! The half marathon necklace that you show is my favorite, but I think that the two-name stamped necklace would be a great wedding gift. You're in my blogroll for sure now :) and I'll add a link back onto my blog. What a great way to celebrate your wonderful accomplishment! Just found your great blog and put a link to your blog on mine. It would be fun to win a marathon necklace. Thanks for the giveaway! Congrats on finishing your first marathon! That is a great finishing time! Thank you SO much for providing the link. What beautiful gift ideas! I will most definitely be bookmarking Darlene's site. The "Marathon Runner Handstamped Necklace" in particular csaught my eye. I became a follower, added you to my blog roll and linked up your giveaway as well. 1) the name or word bracelet! Love that!! 3)Petite Hammered Heart earrings. SOO precious!! And linking back in my post! Thank you Darlene for the beautiful items to give away! I would love the 1/2 marathon necklace, as I am going to train for one this fall. And congrats to Tall Mom on your marathon! I love the bloom necklace! Hi there, I would love to be in the drawing! I love the circle necklace pictured on this post and the Run 26.2 with two little charms. Thanks Darlene for making such beautiful jewelry to help us celebrate our accomplishments! Hey Tall Mom: Congratulations on your first marathon!! My husband is from Seattle so I was thinking about running that one but decided on Chicago this year. I love the 26.2 design. Check out my running tees and greeting cards for future contests at www.remanents.com or our blog at www.aboldpace.com. I look forward to following your blog! I love the Marathon Runner Handstamped Necklace (even though I have yet to run one!) Her pieces are so inspiring! Thanks for offering this giveaway! Also, added you on to my blogroll! okay! No time like a giveaway to make myself known! I love most of those pieces! They are in a similar style to a necklace I just received. I love the pendants, very cool! I'm adding you to my blog roll right now!! I visited the my3gemz shop, my only regret is that I didn't find out about the shop about a week earlier or I DEFINITLY would have purchased the "Class of 2009" bracelet for my cousin's daughter who just graduated, but we already had the party for her so it's a bit too late. I also like the "Girl's First Communion" bracelet, even though I can't think of anyone making their's anytime soon, but I think the slight imperfections in the lettering actually add to the appeal and make it look more personal and less commercial. Thank You Darlene for your generosity in this giveaway. P.S. 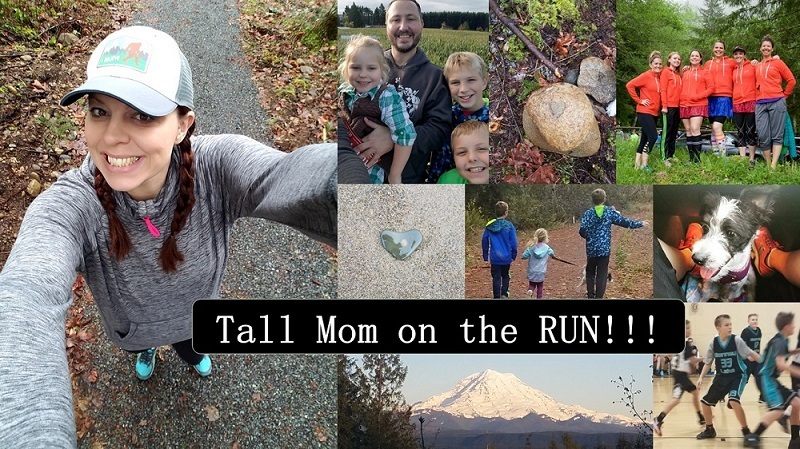 - I added a news link about this giveaway to my running blog, and am a follower of the "Tall Mom on the Run" blog. I like the 26.2 one. I think it would be neat to have a mom's one like that with each kid having it's own piece. Great giveaway..thanks for the opportunity to win. I would get the 26.2 necklace and wear it only after I complete my first marathon in October. i better get to work on that NOW! I just added you to my blog roll. What a cool giveaway! That necklace is rad! When I'm done having kids I definitely would want one of her necklaces with the kids name on it. I liked her running items...An idea would be to have the words "believe" on one of them. Running is so much about believing in yourself to me. The "inspire," "love," 13.1 one was awesome though. Thanks for introducing this etsy shop. Most running jewelry isn't very cute, but this is. Nevermind, my favorite is the Marathon Runner Handstamped necklace. So cute. added you to my blogroll and will link back with my next post. last but not least right? ugh, thanks for the heads up! i like the Marathon Runner Handstamped Necklace a LOT! and i'm already a follower and have you in my blogroll... so i should get 1,987 entries, right?! :) now you have a billion followers, i need to get on the giveaway bandwagon... coming soon! !